Winters can be particularly harsh for chapped lips and itchy dry skin. 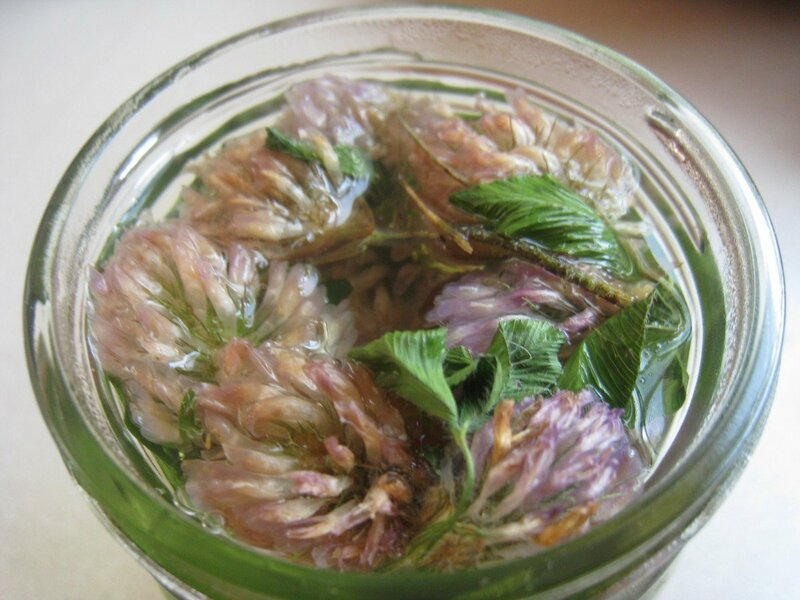 I’ve been tempted more than a few times to buy red clover salve, a skin treatment made with Trifolium pratense, a skin-soothing plant full of antioxidants. Red clover is excellent for treating skin conditions such as eczema, psoriasis, acne, rashes, dryness and other skin disorders. It softens and nurtures skin while also providing anti-inflammatory effects, reducing pain, redness and itchiness. Health food store salves are expensive, however. Some of them contain unwanted ingredients, even if they are natural—sometimes I prefer not to apply essential oils to my skin when it’s red and raw, as they can cause an aggravation. The tubes are also tiny and inadequate for covering large patches of affected skin. Fortunately it’s easy and cost-effective to make your own salve. I often encourage cash-strapped patients to make their own botanical skin treatments at home. Within minutes of applying this balm to my skin, my chapped lips and itchy legs were soothed and redness was calmed. My skin felt smoother, moisturized and less flaky. I’ve even distributed some to small pots to use as a lip balm throughout the day. There are two steps to making a salve. The first is to create an oil infusion from the dried herbs. This process extracts the medicinal properties from the plant using oil. The proper, herbalist way to do this is to cover the herbs in the oil of your choice and leave them in the sun for a week or two. However, since I’m pressed for time, I make oil infusions in the slow cooker. Put the herbs in the small mason jar and cover completely with oil. Fill the slow cooker with water, so that the water level meets the level of oil in the mason jar. Place the mason jar inside the water in the slow cooker. Cook on low overnight. After the oil has been infused with the active plant constituents, strain out the dried herbs using a cheese cloth. Make sure to squeeze out all the good, nutritious oil from the herbs so that none is wasted. Create a double boiler by setting a pot filled with water (I reuse the same water from the slow cooker) on the stove and turning the temperature to high. Sit the mason jar containing just the oil infusion (no herbs) in the water. Once the water is boiling, slowing add in beeswax. A 1:5 beeswax:oil ratio creates a pliable, creamy salve. You can start with less keeping in mind that you can always add more later by reheating the salve in the double boiler. You don’t want to go overboard and add too much beeswax, creating a salve that is too hard. Allow the beeswax to melt into the liquid oil while stirring. Remove the jar from the stove and allow it to cool to room temperature. Once cooled, apply to affected skin areas and enjoy the smoothness.